Self catering 2 bedroom cottage close to lakes for 1 - 4 people. Explore the unspoilt delights of rural France from “Les Geais”. This completely renovated traditional stone cottage is situated in the centre of the Millevaches National Park area of the Limousin, also known as the French “Lake District” due to its numerous lakes, rivers and waterways. This beautiful region offers endless opportunities to enjoy outdoor activities such as walking, cycling & mountain biking while swimming, kayaking and other water sports are possible on the many nearby lakes and rivers. The cottage has a large open-plan living space with well equipped kitchen dining area and comfortable lounge, featuring a traditional fireplace with cosy wood burning stove. The 2 spacious bedrooms, 1 double and 1 twin, both have views across the valley and the modern shower room is on the ground floor. The small, fully enclosed garden area is south facing and the patio benefits from the partial shade of an Ash tree. “Les Geais” enjoys a quiet hamlet location without being remote as all essential local services are available in the village of Bugeat which is just a short drive or 15 minutes walk away. Low cost airlines fly to Limoges Bellegarde airport from Birmingham, Gatwick, Southampton, Newcastle, Manchester and Edinburgh, Stansted, Bristol, East Midlands, Liverpool & Leeds. Car hire is available directly outside the terminal and the airport is about 90mins drive away. Alternatively, if you drive from the UK, the 465 mostly motorway miles from Calais can be driven in just over 8 hours (excluding stops) or you can reduce the car journey by choosing a longer sea crossing, to LeHavre for example. We do recommend having a car to fully explore the area. Brive airport also has a service from London City and Manchester airports. High speed Rail travel is possible taking the Eurostar to Lille and changing for Limoges. Sightseeing and places to visit: Five of the 'most beautiful villages of France' can be found in the department of the Correze, Collognes-la-Rouge, Curemonte, Saint-Robert, Segur-le-Chateau and Turenne, all of which are well worth a visit. The administrative capital of the region - the historic city of Limoges with its tradition of producing fine enamel and porcelain, has museums, cathedral, botanical gardens and plenty of restaurants and shopping. The town of Aubusson famous for its tapestries. Gallo-Roman ruins at Les Cars. The Contempoary Art Centre with its sculpture trail on the Isle de Vassiviere and close the tree top activity centre of Arbre en Arbre. The chateau and home to the National stud at Arnac-Pompadour. The peat bog wetland habitat of Les Tourbieres. The natural landscape at Bort les Orgues. The waterfalls at Gimmel les Cascades. Oradour-sur-glane, is a town left untouched as a poignant tribute to all the inhabitants who lost their lives there, shortly before the end WWII. We still consider ourselves incredibly lucky to have found this property. We were looking for somewhere with access to plenty of open water to indulge our passion for various watersports but didn't realise (at the time) what a wonderful natural playground this region is. This is our refuge from the frantic pace of daily working life in the South of England. We find we can really slow down and 'recharge our batteries' when we stay here. Shower room has spacious shower enclosure with thermostatic shower mixer. Bed linen and towels are included for the first two guests (£5 p/w per additional guest). There are electric radiators in addition to the wood burner. The cottage is well insulated with double glazed windows and is suitable for use all year round. Bed linen and towels are included for the first two guests (£5 p/w per additional guest). There is parking space available in the quiet road alongside the property. Provides heating throughout the cottage and a seasonal amount of firewood is included in the rental. Soundbar with bluetooth capability and Aux connection for iPods, phones etc. It is an ancient property with restrictive doorways and steps. You may see on another listing that there is a separate barn annexe to this property. Please note that this is only available to rent if you are renting the cottage (to enable larger groups of up to 8 people to stay at our property). A relaxing week spent in the cottage, located in a peaceful hamlet but not too far away from local village. The cottage is comfortable and the woodburner provides a cosy atmosphere. We thoroughly enjoyed our 10 night stay. The house is well stocked and really cosy. There is plenty to do in the surrounding area and the scenery is beautiful. It is a great place and somewhere to go to escape the hectic nature of everyday life. A lovely little very well equipped cottage. We stayed 3 weeks, the first one with no vehicle but found the 15 min walk to the village no problem. A rented vehicle to really see the surrounding sights is necessary. As Queenslanders, we found the trading hours of the village a little challenging, they seemed to open and shut when it pleased them and always (as is the general case in France) remained closed for 2 or more hours in the middle of the day. The neighbours are very close but also very colourful which adds to the experience and the cats are a delight. Technology is a little challenging, mobile phone coverage is achievable from the upstairs bedroom window but the very friendly house keeper, who lives about 50 m away, allowed access to her WiFi which helped a lot. Be wary of the power fluctuations, they blew away one of our lap top power supplies. We had a wonderful and relaxing stay at "Les Geais". The cottage and the area are beautiful. So pretty and peaceful. Sue and Tim, the owners have thought of every little detail to make your stay perfect. Everything is top quality. Many thanks for letting us share your lovely hideaway. PS The housekeepers Mo and Rich are so helpful and full of information. Our Lovely French holiday - Summer 2011. We had a wonderful holiday here and would highly recommend a stay. A very peaceful and scenic area to holiday in with lots of countryside to explore - a chance to experience the 'real' France! Lots of places to visit - towns, lakes, etc all easily accessable by car. You can be as busy as you want here because there is lots to see but for us it was too tempting to relax and enjoy one of the local lakes with their lovely clean beaches. Watersports can be found at every lake if you feel energetic! 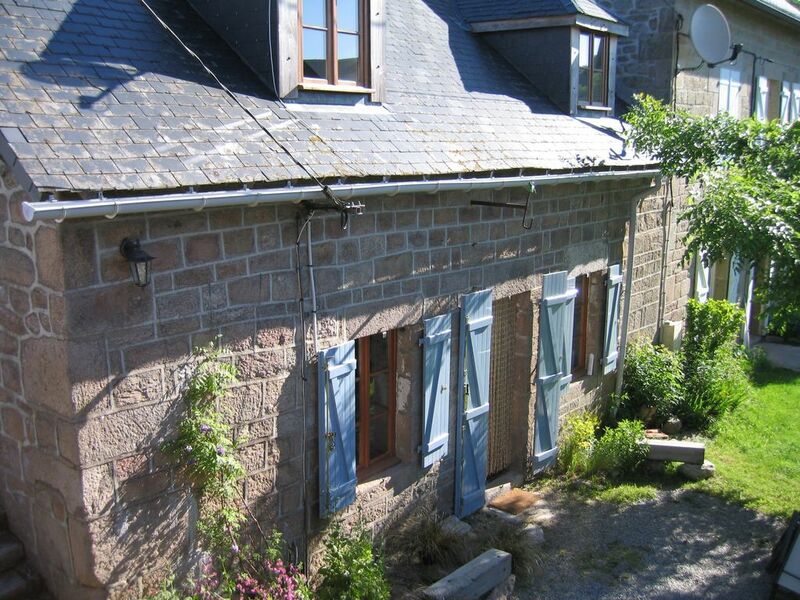 Our accommodation was perfect - a charming French cottage, very well equipped with lots of character. Plenty of space to feel comfortable and for our family to 'spread' out, as well as being clean and bright. The kitchen has everything you need - all appliances and gadgets have been thought of, and this is reassuring as we have a young family and cooking comfortably was very important to us. The bedrooms are light and airy with plenty of room and storage space. All in all we had a lovely memorable stay here and would recommend a visit! Jolie petite maison fonctionnelle et bien décorée. Un séjour très très agréable et reposant. Je vais revenir sans le moindre doute. Situated roughly 1 hours drive to the East of Limoges and the A20, the Millevaches Plateau is an area of natural beauty which is criss crossed with numerous footpaths, cycle routes and mountain-biking trails which can be equally explored on foot or in the saddle. The regional tradition of stone masonry is evident in the many granite crosses, wells and fountains marking the ancient routes as well as in the buildings, bread-ovens and medieval bridges. The Medieval towns of Eymoutiers, Treignac and Meymac are not far away. The lakes near Treignac, Ambrugeat and Vassiviere all have water sports activity centres and, in July and August, the lovely sandy beaches have swimming areas patrolled by lifeguards. While the Vézère and the Vienne rivers offer more adventurous Canoe and Kayaking excursions. South West towards Meymac Mont Bessou, the highest point in the Limousin, rises above the forest to a height of 1000 m with a viewing tower which offers views over the Cantal mountains. Golf: The nearest course is Golf du Chammet at Peyrelevade (approx 25 km). Ski: During the winter months the family ski resort of Le Mont Dore and Super Besse can be reached in just over an hour by car. They offer good snowboarding and skiing particularly for intermediates and beginners. The rental includes cooking gas, a seasonal allowance of firewood and up to 250kwh/w electricity. Bedlinen and towels are included for the first two guests. Linen for additional guests is supplement of £5 per guest/week. Throughout July and August changeover day is Saturday, but we can be more flexible at other times of the year.